plants including microscopic plants use co2 for photosynthesis during the day to convert light energy into chemical energy. oxygen and glucose are a byproduct of this process. at night plants respire, using oxygen to release energy from carbohydrates for their own metabolic needs. simply put during the day plants make food and at night they need to feed. at night, dissolved oxygen in water is lower. on warmer nights such as in summer, dissolved oxygen depletes further in water. changes in the biological loads, can result in oxygen becoming insufficient leading to hypoxic — fish suffocate and die-0ff en masse. this happened typically in a new york channel yesterday. the biological overload came from a shoal of bunker fish fleeing predatory bluefish tuna. the v2 controller supports video streaming and timelapse photography in addition to multiple sensors. we have been able to observer similar hypoxic scenarios happening naturally in our educational and home gardens through data visualization. observe the timelapse video below and notice where the fish create a hockey stick graph. 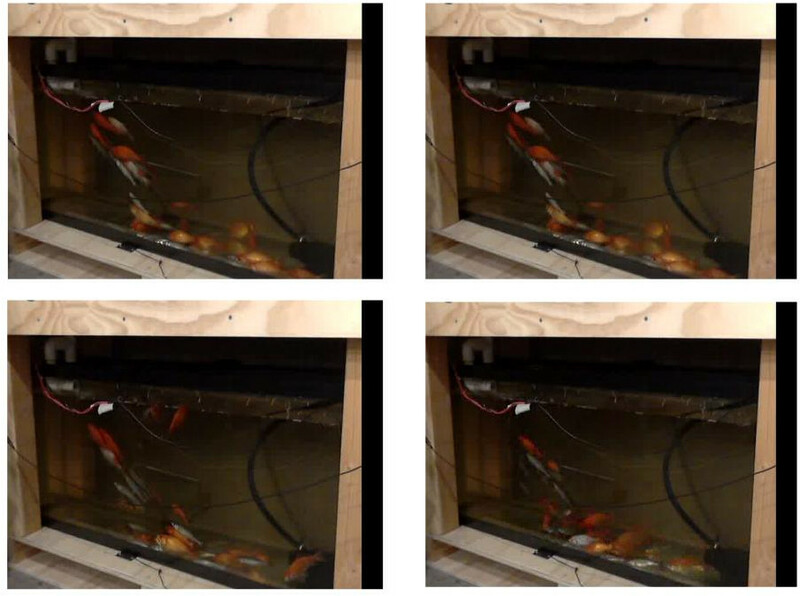 at around 10 secs and at the 25 secs you can see the shape fish make as they compete for a good position under the drainage where dissolved oxygen is richest. this normally happens at about 3am in the morning when dissolved oxygen is low, on hot summer nights when the gardens have large biological loads – fish, plants and bacteria. this would normally lead to fish kill but we now detect these scenarios using the v2 controller platform and mitigate them by adjusting the pump flows to automatically increase dissolved oxygen when the saturation is low. after all the overfishing, it is a shame to see so many atlantic menhaden fish die due to a channel closure in these modern times. the v2 controller could have detected this scenario when the channel filled with terrified fish as well as the hypoxia conditions, opened the gates automatically to save the fish and sent alerts to the relevant authorities – all with a cheap usb camera, some image processing and a little machine learning.